Can you drive a stick? You will find blending and mixing easier than ever with the Maxim 400W Stick Mixer! The mixer has been ergonmically designed so to make the most basic tasks easy. 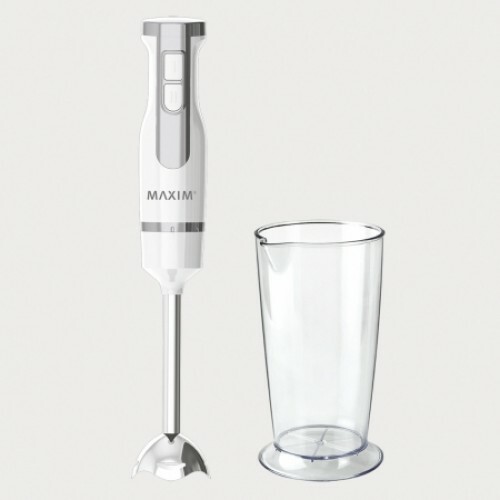 With its super silent and super powerful 400w motor, the Maxim stick mixer is perfect for blending soup, smoothies, whipping cream or making cocktails. Featuring soft touch switches with 2 speed settings, and strong stainless steel blades, hand mixing couldn't be easier. Super silent 400 Watt motor. Soft touch switches with 2 speed settings. Includes a 700ml mixing jug. Great for making smoothies, soup or cocktails.